They say misery loves company, but in reality, company may have the opposite effect and improve the quality of life and longevity for seniors, according to The New York Times. While loneliness is a risk factor for cognitive decline and early death, keeping close connections to family members and friends may help seniors ward off health problems and extend the lives of older adults. A study from the University of California, San Francisco, in July showed that people over age 60 who identified themselves as lonely, had trouble with basic housekeeping and personal tasks, in addition to a 45 percent greater risk of dying earlier than their counterparts, who felt connected to others. Another study from the University of Chicago showed that social isolation puts seniors at a higher risk of high blood pressure and death from stroke or heart disease. This study also found that higher cancer rates, inflammation and decreases in antibody protection were linked with loneliness, according to EverydayHealth.com. The studies don't exactly define what makes a senior "lonely" - whether it's a biological issue or a social issue. Plus, the physical factor of living with another person may or may not make a difference, the research from the University of California showed. In this study, the majority of lonely people, 62.5 percent, were married or living with others. "It's not the quantity but the quality of your relationships that matters," Dr. Carla M. Perissinotto, a geriatrician who led the study, told the Times. "You can’t tell who may be feeling lonely. It's not just a little old lady living all alone." If strong, healthy relationships are key to a long, disease-free life, what can seniors do to make sure they maintain their social connections? 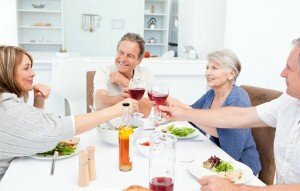 It can be difficult, due to issues like divorce, relocation, retirement and bereavement, for seniors to maintain their relationships with others over time, according to Dr. Erin Cornwell, a professor of Cornell University who led another study showing that social connections matter for the well-being of seniors. She told Fox News that it can help some people to respond to such changes by becoming active in social organizations or spending more time with friends and family. Indeed, getting involved in the community - whether that means volunteering at a local organization or simply taking part in group activities at retirement communities - can be hugely beneficial to seniors' overall feelings of well-being.